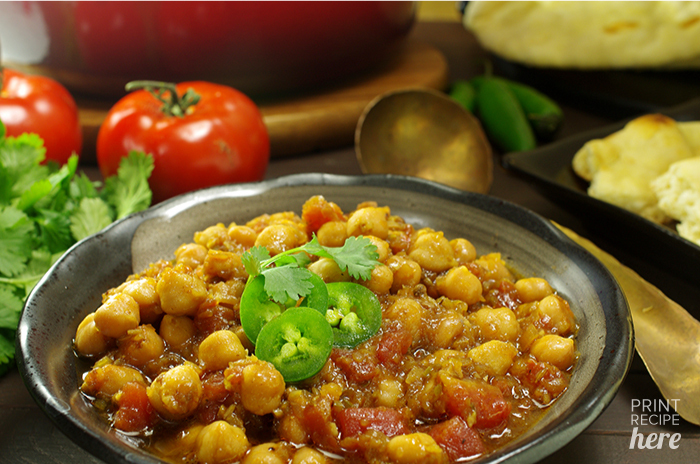 A staple in north Indian restaurant menus across the world, this chickpea classic, called chana masala, raises the humble chickpeas, also referred to as garbanzo beans, to a level that commands a respectable devotion on account of the vibrancy in every morsel. Hearty, comforting, and redolent of just two fresh-bruised whole spices, the combination works with some store-bought flatbread or homemade All Wheat Griddle Breads or plain steamed white rice. 1. 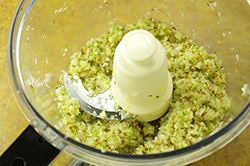 Place the onion, ginger, garlic, chiles, coriander, and cumin in a food processor. 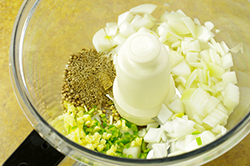 Using the pulsing action, mince these ingredients to create a pungent and aromatic blend. The spices will look bruised but still be fairly whole. Letting the processor run constantly instead of using quick pulses will create an undesired watery and coarse puree. 2. Heat the oil in a medium-size saucepan over medium heat. Once the oil appears to shimmer, scrape the processor bowl’s contents into the pan and stir-fry until bits of onion, spice, and some of the overall good schmutz browns and sticks to the bottom of the pan, about 15 minutes. 3. 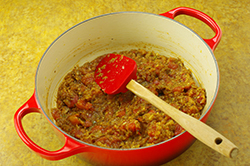 Stir in the tomatoes with their juices and the salt, scraping the bottom of the pan to release the bits of onion and spices, effectively deglazing the pan and releasing those flavors back into the sauce. 4. 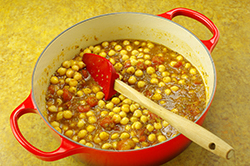 Pour in 1 cup of water and add the chickpeas, giving the curry a few stirs. Once the sauce comes to a rolling boil reduce the heat to medium-low. Cover the pan and let the chickpeas simmer, stirring occasionally, until the curry sauce slightly thickens, about 15 minutes. Serve the curry warm. Here’s why I prefer using pans that have a heavy bottom without a nonstick surface. With a nonstick pan things don’t stick to the bottom. 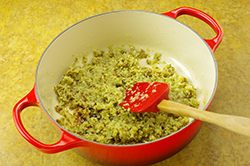 The technique of adding liquid to a pan after things brown and stick to a pan, referred to as deglazing, adds a depth of flavor (called fond in French), that je ne sais quoi we all hanker for in each mouthful. This is by no means a scientifically proven statement, but there is something to say about the benefits of being short (I am average, thank you very much). When you stir-fry a medley that harbors chiles, the pungent aromas that waft from the pan tend to reach for higher points. If you happen to be tall, chances are your coughing and sneezing bout might be more intense than the cute little dog that hovers close to the ground looking for anything that resembles food (I have seen our little Ms. Emma sneeze but never cough). So, do all the tall humans favor and turn on that exhaust fan while cooking with chiles. 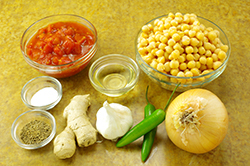 Chana masala in India is often served with thinly sliced raw red onion, slivers of punchy chiles, and wedges of juicy lime. Feel free to do the same. The contrast of the warm cooked food and crunchy raw vegetables is a hallmark of north Indian cuisine. Turn any remaining curry into a delicious appetizer dip. 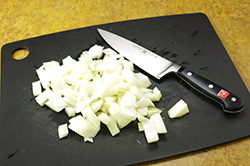 Fold in some of your favorite shredded cheese(s) and a tablespoon or 2 of thinly sliced scallion. Heat the mixture in a microwave on high power until the cheese melts and the dip warms through, 2 to 3 minutes. Serve the dip with a basket of your favorite chips (in my case it is always kettle-cooked potato chips). Reprinted with permission from Indian Cooking Unfolded by Raghavan Iyer. Copyright 2013. Published by Workman Publishing, New York, NY.